BROTHER ISLANDS – The northernmost part of Egypt’s offshore marine park is made up of two islands 60 km away from the coast and 140 km south from Hurghada. The larger island (complete with a lighthouse from 1883) is 400 m long with a spectacular plateau on the south east corner which is dotted with coral mountains and famous for thresher and grey reef shark sightings. The western side of the island has two impressive wrecks which both lie almost vertical on the side of the reef. The most spectacular is the Numidia, a large cargo steamer which sank in 1901 and now lies on the tip of the island between 10 and 80 metres covered in soft corals and frequented by large pelagic predators. The smaller wreck of the Aida (sitting between 30 and 65 metres) was a lighthouse authority supply vessel which sank in bad weather in 1957. The smaller island, whilst only a little over 200 m long, hosts an incredible concentration and variety of marine life. There is a pristine fan coral forest, a massive collection of hard and soft corals and compelling overhangs to explore. The highlight is the fish life; with regular seasonal sightings of hammerhead, thresher, grey reef and oceanic whitetip sharks. SAFAGA – Filled with a variety of stunning drop offs, shallow coral gardens and interesting wrecks, Safaga offers something for everyone. The most famous wreck is of the Salem Express; a large ferry, which sank in 1991 with massive loss of life. There are also the large ferry wrecks of El Arish El Tor and Al Kafain, which both sank without any lives lost. The famous finger shaped reefs of Abu Kafan and Panorama offer stunning drop-offs with plentiful fan corals and incredible plateaus encrusted with soft and hard corals. Shallower reefs (such as Torbia Arbaa) are full of critters and make a perfect afternoon or night dive. DAEDALUS – This huge tear-drop shaped reef rises from the sea bed in the middle of the Red Sea, 80km offshore and more than 300km south of Hurghada. Easily recognised by its zebra-striped lighthouse, this reef offers some of the most amazing dives in the Red Sea. The sheer walls are covered in over-grown hard coral formations and a variety of reef fish. Napoleon wrasses and turtles are often cruising by, but make sure you keep your eyes open on the blue! Daedalus is one of those places where anything can happen… Oceanic white tip, grey reef and thresher sharks are often sighted, but Daedalus is most famous for its scalloped hammerhead sharks which can often be seen in large schools out in the blue during the summer months. The sheer size of this reef means that you can do several dives here and never get bored! FURY SHOAL – This large cluster of reefs offers unforgettable and easy dives. From the northern site of Small Abu Galawa to its most-southern site of Sataya, Fury Shoal can prove to be surprising and diverse. Each dive site has its particularity: from dolphins, to stunning hard coral formations and not forgetting the two little wrecks “Tug Boat” and the “Yacht”. ELPHINSTONE REEF – A Red Sea legend; a finger shaped reef, with north and south plateaus covered in hard and soft corals, unpredictable and exciting this truly is an awesome reef where hammerhead sharks are regularly spotted in the summer and oceanic whitetip sharks often congregate in large numbers during late autumn. ST. JOHNS REEF – Located on the Tropic of Cancer, this chain of reefs boasts stunning dives, most of which are very close to each other allowing you to move quickly and easily from one site to another. The sea scape is varied: drop-offs, tunnels, and stunning hard coral formations. A one of a kind site is St. Johns Caves/Umm Kharalim where the sun plays with the lighting in and through the tunnels: this is a delight for photographers! The great variety in colours of the soft coral and marine life guarantees wonderful dive experiences. With any luck, dolphins or pelagic fish will join you on your dive and it will become unforgettable. HABILLI ABU FANDIRA – This means a submerged reef (habilli), with two main pillars, which are easily explored during this lovely dive. The reef and pinnacles lie between 5m and 24m to the sand where you will find smaller pinnacles covered in soft corals and marine life. Schools of barracuda, jacks and tuna are common and keep your eyes open for bumphead parrotfish. HABILI OHROB – This cluster of pinnacles is covered in beautiful soft corals of all colours as well as a few large fan corals around the bottoms. Pinnacles start at around 6m and go down to around 25m. Large numbers of schooling fish such as barracuda, tuna and jacks can been seen between the pillars and in the deeper areas there is the possibility to see grey reef sharks. The reef tops are covered in yellow soft coral and anthias making for an absolutely stunning safety stop. SHOAB ABU FANDIRA EAST – The drop off point for this dive is on the northern wall, where you will find many u-shaped cracks on the reef and vertical canyons that stretch all the way from the surface to the bottom (27m). This beautiful site is best dived in the early morning, however, to reward you for your early rising, there is thepossibility to see the enormous schools of bumphead parrotfish. Shark & Yolanda Reefs – This is a world renowned dive site, situated at the tip of the Sinai. Two small ergs are joined by a vertical wall dropping into the abyss. At Shark Reef the current allows you to drift along the wall, rich with colourful corals. Moving towards Yolanda Reef you reach a plateau scattered with small ergs and coral outcrops. Continuing around the reef you will come upon the scattered remains of the wreck ‘Yolanda’ complete with its cargo of toilets and baths. The whole of this area is big fish territory so keep an eye on the blue! GUBAL ISLANDS – At the gate of the Strait of Gubal is ‘Bluff Point’, which gets its name from the turbulence created by strong currents that beat the eastern coast of the island. The wreck of the Ulysses lies on the reef 300m north of the lighthouse, starting at 5m and sloping down to 25m. The Barge wreck provides divers with a fun and unusual night dive with the wreck’s skeleton creating protection for all sorts of night critters. ABU NUHAS – Also known as the ‘Ship’s Graveyard’, this reef is positioned dangerously close to the busy shipping lanes of the Gulf of Suez. Abu Nuhas has claimed more ships than any other in the area. On the north side there are four wrecks laying on a sandy sea floor on the bottom of a steep sloping reef layered with table corals. Wrecks here include the Ghiannis D, Carnatic, Tile and Lentil wrecks. On the south side, there is a safe anchorage for liveaboards and two ergs, knows as Yellow Fish Reef. This large circular reef is often overlooked but offers excellent diving on pristine coral from any location on its perimeter. Weather permitting, you can dive the wreck of the Kingston which sank in 1881 and has become part of the reef and is now covered in hard corals. SHA’AB EL ERG – Famous for its dolphin sightings (therefore also knows as: Dolphin House), this shallow reef can offer a dive you will never forget. ROCKY ISLAND – hosts a fringing reef that circles the entire perimeter of the island, dropping steeply to astonishing depths. Keep your eyes on the blue for life but take care as there can be strong currents. ZABARGAD – The island of Zabargad is an amazing dive spot. It is characterised by an enormous mountain reaching out of the water, surrounded by a lagoon and circling reef. There are a couple of wrecks, such as The Khanka (better known as: the Russian wreck; a Russian spy ship) and a great variety of corals and reef fish. Jackson Reef – is the most northerly reef and on its northern edge lays the wreck of a freighter serving as a stark warning to ships in the narrow straights. Diving is usually conducted from the moorings on the south side, which is sheltered from the main swell and currents. Moving northwards you will come across a forest of spectacular gorgonian fan coral at about 20 to 30 metres as well as many different kinds of reef fish. This site can also be done as a drift dive heading from the mooring towards the East with the reef on the left where it is mostly wall diving with excellent corals. 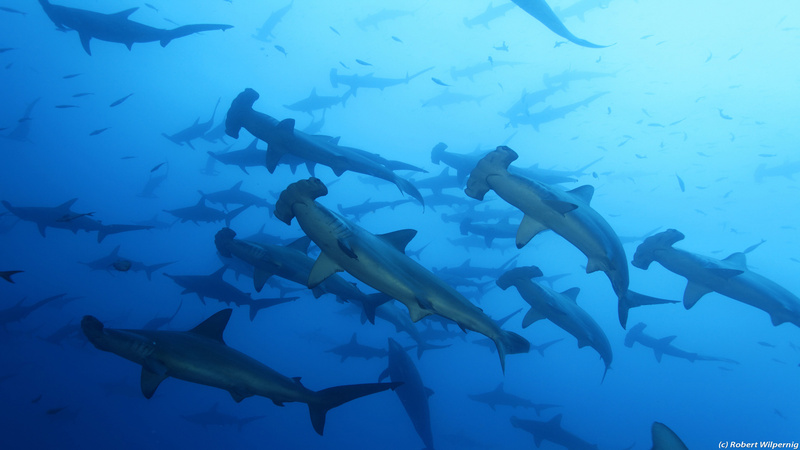 Diving at the back of Jackson in late summer can give you the chance to see the resident hammerhead sharks. Woodhouse Reef – is the longest reef of the four in the Strait of Tiran. Home to reef sharks and eagle rays, it is dived as a drift dive usually from south to north. Jumping at the southern part of the reef is a wall to about 30m covered with coral from the surface all the way down. There is a canyon going along the reef at about 25m which spreads out into a coral garden with sand alleys. Thomas Reef – is the smallest reef in the strait and diving here is governed by conditions as there are potential strong currents. The ends are vertical walls with a large plateau at about 25m on the south eastern side. This plateau is covered in colourful coral has a fence of gorgonian fans where you can find the longnose hawkfish. Gordon Reef – is the most southerly reef of the four and has a different topography from the others offering both a shallow plateau area and drop offs. There is a huge variety of reef fish and the chance to see sleeping whitetip reef sharks on sand patches. At 4 to 5 metres there is an eel garden area along with coral encrusted drums. The top of the reef, with its lighthouse, is also home to the wreck Louilla, which sits almost parallel to the wreck on Jackson Reef. SS Thistlegorm – Probably the most famous of the Red Sea wrecks. The 129m English freighter was bombed by German aviation on 6 October 1941. Today she created an artificial reef on a sandy bottom at 32m maximum depth. She is home to an enormous variety of marine life and is especially popular with large schooling fish. Rosalie Moller – The greenish water on this wreck offers a mystical ambiance rarely found on other Red Sea wrecks. With the main deck at 35m, the superstructure can be explored up to 30m and before you start your ascent. Numidia – A large cargo steamer which sank in 1901 and now lies on the tip of the island between 10 and 80 metres covered in soft corals and frequented by large pelagic predators. Aida – This small wreck used to be a lighthouse authority supply vessel. She sunk in 1957 in bad weather and landed in 30-65m deep water. Book Your Red Sea Liveaboard Trip Today!